“You can’t stop. You’re almost there!” It was my mind shouting at me when I slowed down to a jogging pace. I looked up to the grey sky. Above the lush canopy of acacia trees, there were few stars. The half moon, barely shining, peeked in once in a while, reminding me of its quiet presence. The cicadas were singing in loud unison. The acacia trees have folded their leaves. Nature was calling it a day; I was not. My heart wanted to jump out of my chest; it was beating so fast. My mouth was widely open, voraciously swallowing the air that came my way; I was catching my breath. I just ran past the Malcolm Hall and I knew that anytime soon, I would be completing an entire, non-stop revolution around the 2.2-kilometer UP Academic Oval. I tried hard to focus and soon I heard that familiar sound that I have been yearning to listen to – the sound of my determined soles striking on the pavement. I felt my legs gaining strength again after it weakened from a long time of hiatus. Then, my body obeyed the orders of my mind. 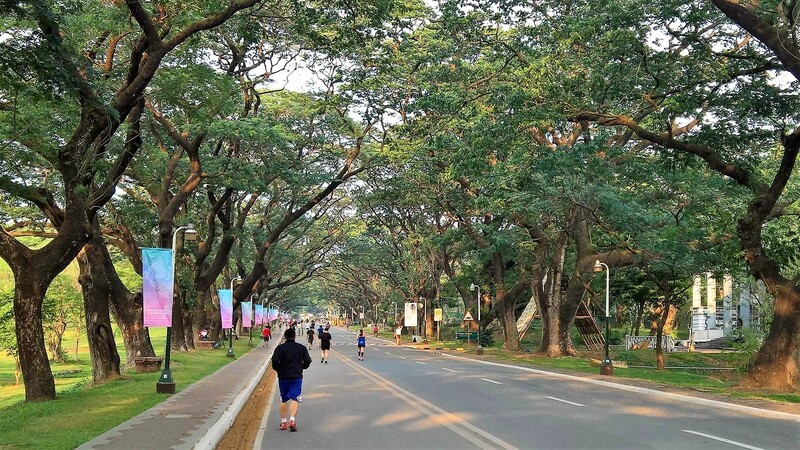 When I reached the Ylanan curve, I launched myself into the breezy air and sprinted my way to the UP Oblation Plaza. My body was burning with intense heat as I sat near the UP Oblation. Every pore on my skin was oozing with warm sweat. I pulled my shirt and squeezed it to the last drop of the salty liquid. I have never perspired as profusely as this since the last official race that I participated more than a year ago. I hugged my knees and bowed my head, feeling my sweat running down my chin and watching them drop on the pebbled pavement. My shoulders began to shake and those sweat mixed with the tears that I have not been able to shed for quite a while. They were not tears of letting go, nor tears of regrets; neither they were tears of anger, nor tears of frustrations. They were tears of exuberant joy for having finally found my long lost stride. I thought I have given up on running, but I was wrong! I have just done it, once again. Life presents several different races that we have to run. Each bears a certain degree of complexity at various points. Sometimes, we are compelled to run all these races at the same time, and we could not help feeling exhausted. We reach the verge of giving up. We deviate from the right course in favor of less difficult paths, only to find ourselves facing a dead end. We envy others who are running their races on a smooth route, so we get off our own track and follow theirs, only to feel unhappy because our real goals and passions were not satisfied. It is all right to feel the fatigue when life gets the most out of our energy and sanity. It is completely fine to wallow in pain when our hearts are deeply broken. It is no shame to lament when our greatest dreams are frustrated. My friend, it is okay to feel this way. We are all weary runners in one race of life or another. Be very brave to discover life beyond these trials. Please carry on. Continue where you left off. Do not withdraw from the race. Refuse to give up on your dreams. Claim the victory of the good fight. When my body has cooled down, I felt an incredible feeling of lightness. Runner’s high as they say, but I felt it was more than the happy hormones that affect my physiological disposition. I stood and I felt that everything around me was beautiful and fragrant. On my right side, the UP Oblation is standing still in its sacrificial position. I stared at the concrete sculpture for a few seconds. The figure of a young man is stark naked except for a fig leaf that covers that sensitive part of his robust body. How vulnerable! And shouldn’t our life be sacrificed in the same manner, with all its vulnerability and everything it has been through, for the glory of its Creator? Like Abraham who was provided with a ram after he obediently followed God’s command to sacrifice his only beloved son Isaac, the lasting value of our sacrifice comes after we have wholeheartedly offered our lives to God who first loved us. The race is not over. Cross the finish line. This is exactly what I needed to hear/read! Thanks for reminding me to carry on, jays. Thanks for rerouting me to your page. I missed your raw and sincere stories. I’ve been reading for the past couple of hours, thank you for continuously writing and inspiring. I’ve been trying my best to hold back the tears…. Glad that you followed up on me! Kung hindi pa ako ng re-scan ng blog roll page ko i wont notice that you updated and thank you! This reminds me of the race we have with Christ that at the finish line, our price is Christ himself. I always tell to my coregroup about this race and we should be aiming about “well done my good and faithful servant”. You’ve lost me in your crowd of followers. I’m happy that you visited my blog. Thank you! I love the last sentence. I can’t agree more. Salamat sa pagdaan! Babasahin ko ang blog mo. We can’t say other people’s lives are better and easier because we really don’t know their struggles. And we have our own destiny. We can’t take their path because that’s no where we’re meant to go. We have our own calling and we’ll get there in time. We just need to keep on keeping on. I couldn’t agree more! God has laid the path before us and we are here to run the race. Tama ka! Kanya-kanyang karera yan. Here’s to our own finish lines! Yes. Slowly. I need to get back in shape. Your are an incredible writer. May we run the race that is set before us with endurance and persistence keeping totally focused on the Lord!! We can make it through the finish line with the help of God who gives us strength. Thanks Rolain! I’m glad you like it. Thanks for visiting!